Several guided tours are available of the local area. 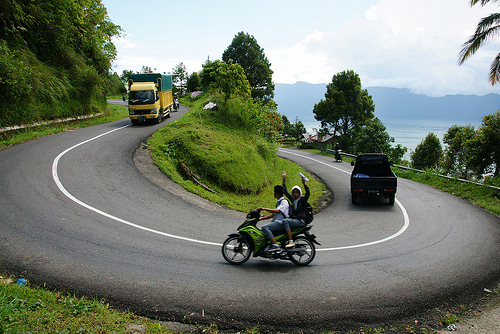 Tours are usually by motorbike, but a car can also be used if requested. If you have any questions about these tours, or would like to enquire about prices, please just e-mail us. Walk down from Ana’s Homestay to Bayua Beach inn. The view from Puncak Lawang over Lake Maninjau. Go by motorbike to the other side of Lake Maninjau, then either walk an hour or go by bike through the jungle to visit the beautiful Sarasah Gadi Tanti waterfalls, which have a little bathing pool at the bottom. Along the way it is possible to see monkeys and the short-tailed maca. Stop for lunch at a traditional Minangkabau restaurant (lunch included in tour price). On our way home we will go to Kokoban – the bat village. The 44 Bends. (Thanks to Peter Dalsgaard for this photo). Enjoy a scenic ride through the rice-fields to the Palupan Nature Reserve, where you can see the world’s biggest (and smelliest!) flower, the Rafflesia. Then, try a cup of Luak Coffe, which is one of the world's most expensive and low-production varieties of coffee. It is made from the beans of coffee berries which have been eaten by the Asian Palm Civet , then passed through its digestive tract. The Rafflesia flower. (Photo from Wikipedia).